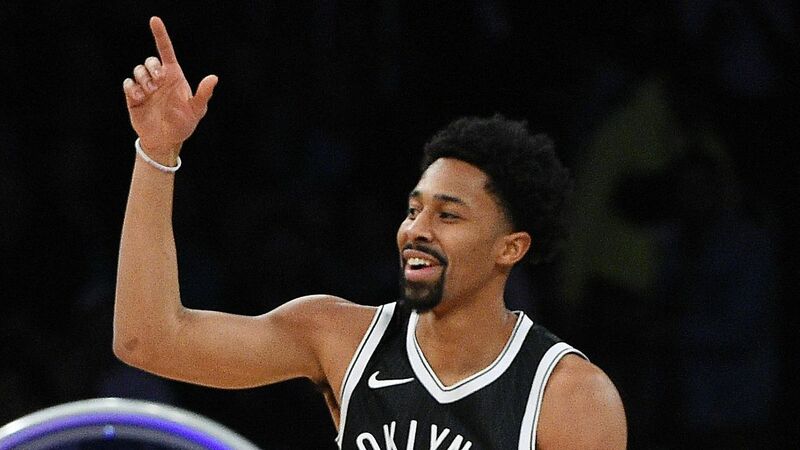 NEW YORK -- There was no big celebration for Spencer Dinwiddie when he signed a contract extension withBrooklynthat guarantees a paycheck in an NBA where he once couldn't even hold a job. "Other than that, basketball-wise, we're not where we want to be, so we've got to continue to push and go forward," he said Friday. "We're trying to make the playoffs and we're trying to win championships in the future. That's what I signed on to be a part of and I'm also trying to push my limits individually and hopefully that helps the ballclub as much as it possibly can." They signed the 6-foot-6 guard to a three-year extension worth about $34 million, rewarding Dinwiddie for his rise from the NBA G League to one of the league's top sixth men this season who scored a career-high 39 points in his last outing. Nets leadership believes there's more to come. "We want more. I think he wants more," coach Kenny Atkinson said before the Nets beat the Washington Wizards 125-118 behind 18 points from Dinwiddie. "I think the potential, there's kind of no limit on it because of how athletic he is, how big he is, how young he still is. I don't see why he can't keep trending upwards. He's got all the tools." Those tools weren't always so obvious, as Dinwiddie was waived twice by the Chicago Bulls after they acquired him from Detroit, where he had been a second-round pick in 2014. He was playing with the G League's Windy City Bulls before the Nets signed him on Dec. 8, 2016, and Dinwiddie has made the most of his opportunity in Brooklyn. His breakout came last season after injuries to point guards Jeremy Lin and D'Angelo Russell. He finished third in voting for the Most Improved Player award after averaging 12.6 points. This season, he's scoring 17.3 points per game off the bench, picking up his play after leading scorer Caris LeVert was lost to a dislocated right foot. "I think the timing was just right for many reasons," general manager Sean Marks said. Dinwiddie's career night in a victory at Philadelphia on Wednesday had no impact on the negotiations, even though the deal was agreed to in principle the next day. The Nets had already seen enough by then to know they wanted to keep Dinwiddie around, and he already knew he wanted to stay. "It's deserving. It's deserving of him right now, and you want to reward a guy that has bought in entirely," Marks said. Spencer Dinwiddie throws down a big two-handed slam in the first quarter against the Wizards.